Arthritis is disease of the joints. Pain, swelling, and stiffness are the primary symptoms of arthritis. Any joint in the body may be affected by the disease, but it is particularly common in weight-bearing joints such as the knee, hip, and spine. Although there is no cure for arthritis, there are many treatment options to manage pain and live an active life. In a shoulder affected by arthritis, inflammation causes pain and stiffness. The shoulder is made up of 3 bones – upper arm bone (humerus), shoulder blade (scapula), and collarbone (clavicle). It has two joints. One joint is located where the clavicle meets the tip of the shoulder blade (acromion). This is called the acromioclavicular (AC) joint. The other joint is where the head of the humerus fits into the scapula, called the glenohumeral joint. Determining which joint is affected and the type of arthritis, you will be advised treatment accordingly. Osteoarthritis – is a condition that destroys the smooth outer covering (articular cartilage) of the bone, causing the joint bones to rub against each other with movement, causing pain. Occurs in people over 50 years of age. 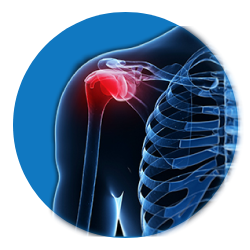 Rheumatoid Arthritis – Rheumatoid arthritis is equally common in both joints of the shoulder. It’s a chronic disease that attacks multiple joints throughout the body. Post-traumatic Arthritis – develops after an injury, such as a fracture or dislocation of the shoulder. It is a form of osteoarthritis. Rotator Cuff Tear Arthropathy – Arthritis can also develop with rotator cuff tendon tear. The combination of a large rotator cuff tear and advanced arthritis can lead to severe pain. Avascular Necrosis – Avascular necrosis (AVN) of the shoulder is a painful condition, It occurs when the blood supply to the head of the humerus is disrupted causing destruction of the shoulder joint. Pain: Any movement of the shoulder causes pain which is aggravated by activity and worsens progressively. Night pain is common and can disrupt sleep. Pain throughout the shoulder if both the glenohumeral and AC joints are affected. Limited range of motion – It may become more difficult to lift your arm to comb your hair or reach up to a shelf. You may hear a grinding, clicking, or snapping sound (crepitus) as you move your shoulder. Physical examination and medical history of the patient are evaluated.